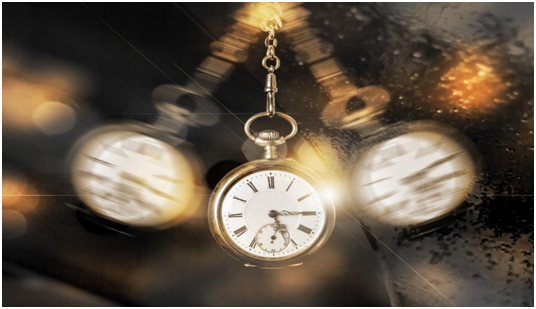 Where does the impression of time flow come from? I want to make an analogy. Suppose I stand, rotate a few laps and stop. Then I will have an overwhelming feeling that the whole universe is spinning. I feel the rotation, but I know that the universe has not rotated. Similarly, I feel that time is flowing, but of course, I know that it does not flow. Moreover, it is possible that the interpretation of this illusion is related to something in the brain and is related to memory (such as dropping a certain piece of memory). Therefore, this is a feeling of ours, but it is not one of the nature of time itself. Another thing people think about is that they believe that the negative flow of time is a denial of the time’s asymmetry for the world. Of course, things in the world all follow a sequence of directions. Drop the egg on the ground and it will break. You won’t see the eggs reassembled. Buildings will dump after the earthquake, and they will not automatically re-emerge from the gravel pile. There are many examples of this kind of asymmetry in our daily life; this is the nature of the world itself. This is not the nature of time, and the interpretation of this can be traced back to the very early universe and its initial conditions. That is a completely different and worthy topic to discussion. Time can flow and cannot flow, this is a part of philosophy.